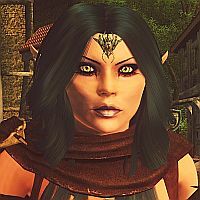 Since autumn 2007, I create mods for the game The Elder Scrolls IV Oblivion. After I did some tutorials, I started my very first project: a house on an island near Anvil. This project woke my passion for making mods. Retextures of weapons and armors, conversions of armors/clothing to Exnem/HGEC and Robert Male and new races followed. Through my work on Abyss Demon, I was able to build 3d models (e.g. weapons and armor) from scratch with the help of Blender. Selene was the name of my first female Oblivion character. Unfortunately, her savegame doesn't exist anymore. And the numbers in your name? Are they your telephone number or just random? They are my date of birth (dd mm yy). Now you know how old I am . Selene’s Shadow Realm uses SSL now! Selene's Shadow Realm Copyright (C)2018. All Rights Reserved.